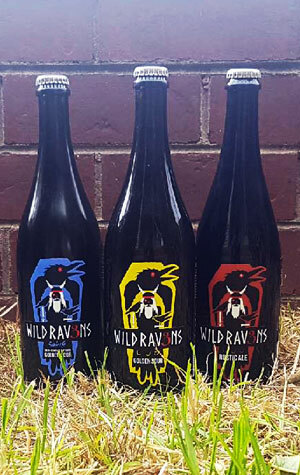 Wild Ravens is the name given to the series of mixed fermentation beers from Thornbury's 3 Ravens. And, even for a brewery that's put itself among the most adventurous and experimental in recent times, it tends to be where their wilder flights of fancy are found. For autumn 2018, they've released three at once: two of them closely related and a third that's a piece very much of its own. The Golden Sour is a beer that's been a long time in the making, starting out a relatively simple affair, featuring oats, rye and a "fruity yeast", before spending 18 months in barrels with a mixed culture of wild yeast and bacteria then, lastly, being blended and refermented in bottles. There are elements reminiscent of a table beer, yet it's bigger and more aggressive: a beer that clings to the glass and delivers a viscous mouthfeel. The oak delivers some creamy vanilla like characteristics and there's some sweetness to be found in there too. But you're more likely to remember its tangy acidity and gueuze like barnyard funk than anything else. Its sibling-of-sorts is the Spinoff Skin-contact Riesling Golden Sour, a beer with similar bones and which spent 12 months in French oak with the house culture. It was also refermented with skin-contact Riesling pomace from the Grampians then matured for a further three months before bottling. And, when sampled at Crafty Towers, consensus was it was the most enjoyable of the three. Much paler than the Golden Sour, with no head but a sprightly, tiny bubble carbonation, you're under no illusion it's a hybrid, with aromas akin to a late harvest dessert wine. There's distinct citrus characters – freshly squeezed lemons and grapefruit zest – to the fore too, and a nice balance between sweetness and acidity. As for the Rustic Ale – a "strong brown Provision Ale” – this again spent time in barrels, freshly emptied and unrinsed from their previous owners, along with the house culture and a higher level of hopping. The aroma offers up plenty of sweet bread and rich biscuity malts, with hints of the beer's sour side, leaving an overall impression of an old beer or stock ale. There's a pretty potent, wine like acidity and redcurrant and berry flavours within its fruity midst. Indeed, given its size (8.5 percent ABV) and the punch of the malt on the nose, it's surprisingly how lean it presents: full-bodied yet relatively light on the palate while also sweet and dry, fruity and funky.